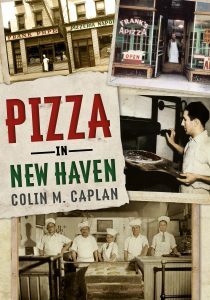 Purchase Pizza in New Haven by Colin M. Caplan and reserve a signed copy of one the most in-depth histories on pizza in America. Shipping is included and all books shall be signed by the author. Orders will be delivered within 2 days of purchase. -Also available for pre-purchase on AMAZON.com. Pizza in New Haven is the culmination of over 140 years of Italian cultural and culinary influence in this storied Yankee industrial city. Caplan captures a legendary but forgotten past showcasing the toils of immigration and factory work and the bonds created through preparing family recipes. The book opens readers’ appetites to one of the earliest and most influential pizza making cities in the country and how these hardworking families built a culinary industry around their shared passion for their native comfort food. The same coal that supplied the world with New Haven’s factory fare cooked the delectable pizza that fed mill workers, produce farmers, politicians, college students and townies of every color, creed and carriage alike. New Haven’s historic pizzerias dominate the city’s food landscape and attract hungry and curious visitors from around the globe looking to satisfy their quest for what is unequivocally the greatest food to ever be made.